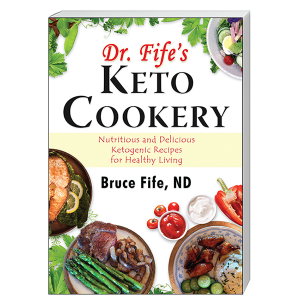 Dr. Fife is famous for his books on coconut oil and Alzheimer’s. He knows a lot about healthy fats and now he has created a cookbook to show you how to follow the Keto lifestyle. With almost 450 recipes I was a little overwhelmed at first. So I decided just to try the recipe that looks most appealing. So I made the “Hearty Egg Drop Soup” and it was absolutely delicious. My husband had three bowls! The recipe just calls for chicken broth (I used water and chicken base which saves time) chopped chicken (I used leftover chicken breast I was keeping in the freezer), celery, onion, mushrooms (I used 1/4 cup frozen peas instead), butter and eggs. The eggs are poured into the hot soup and cook almost instantly. I felt this was a very quick recipe to make on a weeknight. Oh yes, it also has sliced green onions for a garnish. I also ground fresh pepper into each bowl of soup. The recipe says it serves 4 but we got 6 servings out of the recipe. So I’d say serving sizes in this cookbook might be a little larger than expected. Once I tried this recipe and realized how good it was I was eager to look for more recipes. I went through the book, dog-earing the pages and ended up finding about 50 more recipes to try. There are Persian, Indian, French and Turkish recipes which also look delicious. You will also learn many basic recipes like mayonnaise (does contain raw egg yolks however so caution is required). The sections on meats were very well explained with adequate advice on how to cook various cuts. There is also a recipe for Keto bread which is handy. The bread is made with almond flour, eggs and cheese. You can use them for sandwiches or hotdogs. Some of the salad recipes are quite gourmet including some that call for strawberries and another that calls for salmon and peaches. Yum. I can’t wait to try those when peach season is in full swing. I also felt the section on vegetables was very creative and detailed. Some of the recipes call for sauces taught earlier in the book. For the sauces you will need to get some thickener like arrowroot powder. What you will find in this cookbook is a different way of handling recipes that normally have lots of carbs like potatoes. Instead you will find creative ways to use cauliflower. If you love eggplant there are also some good recipes. I felt the recipes were very well written and simple to follow. The ingredients called for in the recipes are not hard to locate and should mostly be at your local grocery store. Coconut aminos and apple cider vinegar may be found at your health food store. What I noticed mostly in this cookbook is that there is a generous use of herbs and spices which make cooking so fragrant and wonderful. This cookbook gives you an entire repertoire of recipes that are nutritious and made with real foods. The idea is to increase fat, decrease carbs and balance things out with moderate protein consumption. Please consult with your doctor before changing your whole diet if you plan on going Keto. I’m loving this cookbook and I think you will love it too. The book is available from the publisher at www.piccadillybooks.com or from www.amazon.com.